Pierce each steak several times with a fortk on both sides and place in a shallow glass baking pan (don't use a metal pan). 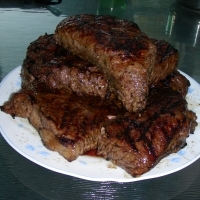 Sprinkle steaks with seasoning, pour worcestershire sauce over the steaks and add the garlic. Turn the steaks to ensure they are well-coated with seasonings. Pour cola over steaks to completely cover. Cover the pan with plastic wrap and refrigerate for 2 hours, turning the steaks after the first hour. Discard marinade and barbeque to desired doneness. *I use a large ziploc freezer bag instead of a pan - it works great for marinating and makes turning a snap.